The Dooars region politically constitutes the plains of the Darjeeling District, the whole of Jalpaiguri District and the upper region of Cooch Behar District in West Bengal and the districts of Dhubri, Kokrajhar, Barpeta, Goalpara and Bongaigaon in the state of Assam. The altitude of Dooars area ranges from 90 m to 1750 m. There are innumerable streams and rivers flowing through these fertile plains from the mountains of Bhutan. In Assam the major rivers are Brahmaputra and Manas, and in northern West Bengal the major river is the Teesta besides many others like the Jaldhaka, Murti, Torsha, Sankosh, Dyna, Karatowa, Raidak, Kaljani among others. The banks of these rivers are favorite spot for the fauna of the region and one can easily spot animals during the early hours of the day or late in the evening. It is always advisable to visit these places either during sunset or during sunrise.Bison, deer’s, elephants visit in herd. Leopards are also found here.Thus, it is always advisable to have a guide while touring. Other animals which can be spotted are rhinoceros, Gaur, Asian Elephant, Sloth bear, Chital, Bengal Tigers, Indian Wild Dogs, Indian Wolf, Pygmy Hog, Giant Squirrels, Hispid Hare, Sambar Deer, Barking deer, Hog deer, Wild boar, etc. Many wildlife sanctuaries and national park like Manas National Park in Assam, Jaldapara Wildlife Sanctuary , Buxa National Park ,Gorumara National Park , Chapramari Wildlife Reserve and the Mahananda Wildlife Sanctuary in West Bengal are located in this region. The Dooars or Duars (in Bengali & Nepali) are the floodplains and foothills of the eastern Himalayas in North-East India around Bhutan.Duar means door in Nepali and Bengali languages, and the region forms the gateway to Bhutan from India. The Western Dooars is known as the Bengal Dooars and the Eastern Dooars as the Assam Dooars. The Dooars valley (also called Duars) stretching from River Teesta on the west to River Sankosh on the east, an area coving roughly 130 km by 40 km, the Dooars forms major part of the Jalpaiguri district. 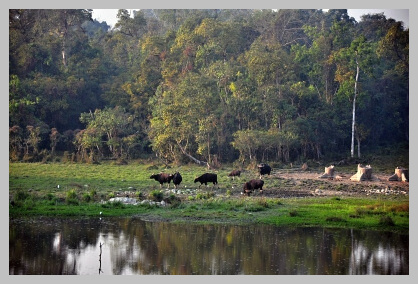 Dooars tourism offers multitude options to visitors like trekking, adventure sports and nature trails.The Gorumara National Park at Dooars (Duars) was declared the "Best National Park" in 2010. Dooars can be reached by rail, road and air. since the majority of hotels and resorts are located at Lataguri, the most convenient entry to the Dooars is through NJP or New Mal junction. The nearest airport is Bagdogra (IXB). India Beacons Sojourn arranges for pickup from all road and rail heads in the Dooars. Our Dooars packages are comprehensive Dooars Package and cover areas like Gorumara National Park, Samsing, Sunthalekhola, Jhalong, Bindu and Murti depending upon the length of time you have in hand. It also includes morning and evening Jungle Safari. . Choose your Dooars Tour package from the list of various Dooars Tour Packages that suit your time. Send us your enquiry for any Dooars package and we would be glad to revert as soon as possible. Is simply dummy text of the printing and typesetting industry. It has survived not only five centuries.